Since 1986, when I established Spontaneous Accomplishments, I have enjoyed making photographs of an enormous number of works of art for the fine arts community around New York City. My clients include major museums, private and corporate collectors, and established artists. Yet I give emerging artists and startup galleries the same concerned effort, skill and care when photographing their works that I give the name-brand folks. Prior to setting up my freelance business, I was a staff photographer at the Metropolitan Museum of Art, where I became thoroughly educated in the nuances of lighting specific works of art from the major cultures of the world. As an imaging consultant, I have taught seminars in photography at the graduate level, and also given advice to various private, educational and institutional organizations concerning the details of making the successful transition from film-based methods and archives to the dizzy digital world. The recipient of multiple awards for photographic excellence from professional organizations, I am eager to share my knowledge and experience with sincere students. 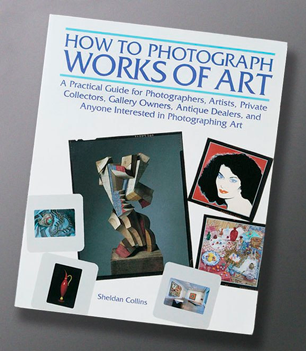 Surprisingly, for a book focussing on a narrow specialty, “How to Photograph Works of Art” has enjoyed great success, with over 18,000 copies printed since 1986. As a seminal work, based on clear explanations using simple but lively language, profusely illustrating specific techniques for lighting a wide range of materials to be recorded with a variety of cameras, my book is modestly called “the bible of photographing fine arts” by former students and assistants. Although currently out of print, the book can be found used at online book sellers.